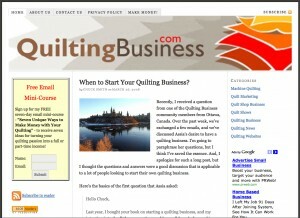 One of the top questions I received recently was about starting a quilting website, or improving an existing website. I've been developing websites for well over 15 years, and have spent a lot of time evaluating the best ways to get things done. I've coded sites by hand, used Front Page and Dreamweaver, and have also looked at various software platforms for websites. WordPress is FREE. You don't spend a thing on the software. WordPress is extensible. Lots of people are adding new functionality to it every day. WordPress is easy-to-use. Once it's set up, you can easily add new content. WordPress is interactive. Just like Quilting Business, you can solicit comments from your community. looks great: There are 1,000s of themes (templates) available for WordPress, most for free and some premium themes for purchase (usually for less than $100 – I use the Thesis theme and am an affiliate). In addition, you can hire a designer to spiff up a template to make it your own. search engines love: Google and other search engines love blogs because they are usually built around a specific topic and are updated frequently. Fresh, targeted content is the best way to move ahead in the search engine rankings and WordPress makes it easy to optimize your site and update your content frequently. that's extremely flexible: Depending on your quilting business, you may need to have a shopping cart, a quilt class calendar, some video, a picture gallery, or a chat function for customer service. WordPress offers plugins for all of these features and much, much more. that's inexpensive: The basic WordPress software is free at www.wordpress.org. It's also part of many web hosting plans, allowing you to set up your site with the click of a button. For the cost of hosting (as cheap as $10 a month), you can have a website based on WordPress set up and running in minutes. And, there are 100s of people out there who can do a lot of the work for you. Obviously, this post is not going to get you up and running with your own WordPress-based website without a lot more instruction. There's a lot more to running a successful website than just putting it up on the Internet and letting it sit. A successful website requires some work, but if you get your WordPress-based quilting website set up correctly, and spend a few hours a week (usually no more than 2 – 3) to do some basic search engine optimization, you can really make a difference to your business. If you're interested, I can start putting up more information about how I use WordPress and what you can do to build your own WordPress site. Also, there is a ton of great information at www.wordpress.org, so spend some time checking it out. And use the Comments to send me questions (or comments) about WordPress and your quilting website. Yes! Please give us some more info about WordPress! I put up my website doing it the hard way – all coding. It’s still not working properly, so I’d love a WYSIWYG (what you see is what you get) tool like WordPress. I installed it but see some immediate problems with having to define a database, etc. So, yes, please more info….perhaps even a sub-group for web help? Hey Liz. On the database, a lot depends on the hosting you have. If you have a host that offers Fantastico, you can have that application install Wordpress automatically. Otherwise, you just need to create a new mySQL database in your hosting control panel and then change the settings in your Wordpress install. It seems more difficult than it really is. I’ll think about the best way to handle some of these things from a teaching perspective, and go from there. Yes please I could realy use some more info. I want to build my web page as soon as possible. Thanks for what you are doing.